A group of former Siri engineers have begun work on a next-generation digital assistant that they say will outsmart any of the current offerings, but some of the goals they claim to be working on have already been reached by Apple's own voice-driven personal assistant. The crew's latest project, called "Viv," was unveiled on Tuesday in a new profile from Wired. Viv is variously referred to throughout the piece as a "radical new AI" and "potentially very big," with company cofounder Adam Cheyer going so far as to say that his goal is to "fundamentally change the way software is built." Cheyer, along with partners Doug Kittlaus and Chris Brigham, boast the pedigree to back up their assertions. The three are credited for the invention of Siri as we know it today, following its separation from research firm SRI International, who developed its language processing capabilities for the Department of Defense's research arm. They sold Siri to Apple in 2010, and eventually left the Cupertino giant one-by-one after Siri's debut in the iPhone 4S. After getting back together two years ago, they brought in a number of artificial intelligence experts —including researcher Mark Gabel from the University of Texas at Dallas and IBM's David Gondek, who worked on Big Blue's Watson. 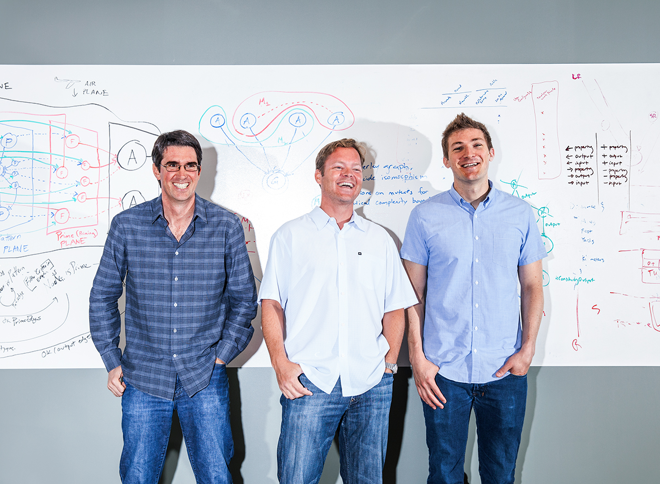 Despite the lofty goals, what Viv actually seems to be is a kind of "Siri expansion pack." Where Siri represented a revolutionary step in natural language processing, Viv appears at first blush to be more evolutionary. Rather than conceptually redefining artificial intelligence, as is suggested, Viv instead logically blends together an enormous number of backend services —one example has the system mingle ingredient lists with wine pairing databases, point-of-interest data, retail catalogs and routing information to tell the user where he can pick up a cheap bottle of wine that goes well with lasagna on the way to his brother's house. Such a feat is impressive, to be sure. Former Google Now product chief Vishal Sharma was said to be "blown away" by the pasta-centric demonstration, saying that he didn't "know any system in the world that could answer a question like that." Another example, given by Kittlaus, leaves a slightly different impression. "Google Now has a huge knowledge graph--you can ask questions like 'Where was Abraham Lincoln born?' And it can name the city," Kittlaus said. "You can also say, 'What is the population?' of a city and it'll bring up a chart and answer. But you cannot say, 'What is the population of the city where Abraham Lincoln was born?'" Google Now may not be able to answer that question, but Apple's Siri already can. 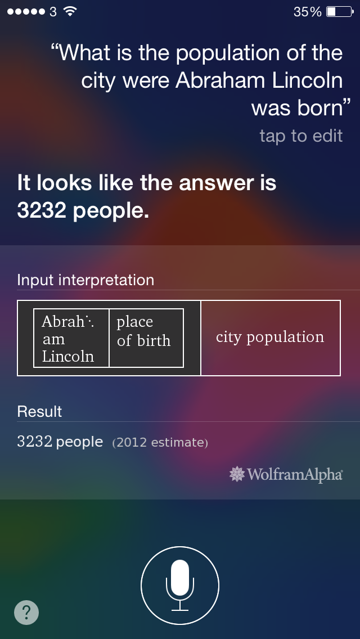 Thanks to integration with Wolfram Research's Wolfram Alpha computational knowledge engine, Siri promptly informs users that the population of Lincoln's hometown of Hodgenville, Kentucky was approximately 3,232 people as of 2012. Apple is also moving rapidly to enhance Siri. Since its introduction, the digital assistant has added deeper integration with iPhone and iPad hardware, and will gain real-time voice recognition and song identification functionality in the forthcoming iOS 8. Even Viv's backers are cautious of its future prospects. "Many things can go wrong, but I would like to see something like this exist," Sharma added. "Viv is potentially very big, but it's all still potential," said Siri funder Gary Morgenthaler, before adding that he has "very high confidence" that the Viv team can pull it off. "I only have doubt as to when and how."